Maharani Sita Devi (1917 - 1989) was known the world over for her extravagant lifestyle as the wife of Maharaja Pratap Singh Gaekwar of Baroda, the 8th richest man in the world in his day. She was a great beauty with a love for fine jewelry. She was high society, very popular and extremely outgoing in her ways. Sita Devi showed off her jewelry in a non-tradition Indian way. Even though she wore fabulous saris, she would make sure that the beautiful fabrics didn't cover up any of the jewels being worn, and, her head was usually uncovered. She even smoked in public! The Maharani was a regular customer of Harry Winston, Cartier and Van Cleef and Arpels. Sita Devi was also the proud owner of the famous seven-strand Basra Pearl necklace, the 34.65-carat Princie Diamond (one of the largest pink diamonds ever found valued at 40 million dollars), the Dresden (78.5 carats) and the Star of the South diamonds (128.48 carats). Indian royals are known to own some of the worlds most expensive gemstones and jewelry. The wearing of these jewels brings to light India's fine craftsmanship, exquisite designs and it's riches. Jewels of a Maharani was inspired by the style of jewelry known as Kundan. 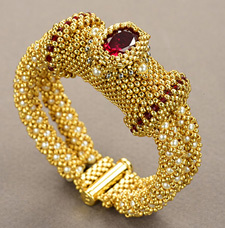 The word, Kundan, means "pure gold". The process is to make a thin gold foil that either sits between the gemstone and the mount to reflect light or the foil is pressed and molded around the edge of the gemstone or pearl. It is one of the oldest forms of jewelry made and worn in India. In the case of this design, an oval CZ is bezeled and mounted on top of a shaped tubular structure. Two netted pearl ropes, evoking the style of Kundan, pass through the main terminal focal piece and end in a sliding clasp.